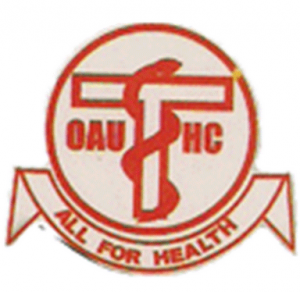 NOTE: OAU School of Health Information awards you National Diploma (ND) and Higher National Diploma (HND) but not Degree. The school is under the umbrella of the Teaching Hospital as a School of Health Technology. After completing your National Diploma, you can proceed to any university to pursue equivalent degree course or obtain HND form. 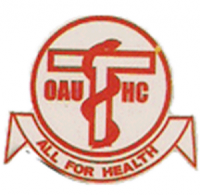 This is to bring to the attention of general public that sales of forms for admission of new intakes into the School of Health Information Management [SHIM], [OAUTHC], Ile-Ife for 2018/2019 academic session is on-gonig, interested candidates must have sat for the UTME examination and obtained five (5) O’Level credits at not more than two sittings in English Language, Mathematics, Biology/Health Science and Chemistry are eligible to apply. In addition to the above, all applicants must know that final admission into the school shall be based on the JAMB-UTME approved cut-off marks as later decided by JAMB for polytechnics, Monotecnics and Colleges of Education in the 2018/2019 academic session. Candidates seeking for ND admission must have obtained the minimum entry requirements of five (5) credits at not more than two sittings in the WASC/SSCE/NECO/NABTEB in the following subjects, English Language, Mathematics, Biology/Health Science, Chemistry and any other subject such as Physics, Agric Science, Geography and Economics. Candidates must sit for the 2018 JAMB examination and must meet the cut-off points [i.e.as stipulated by JAMB] and chose the school as their first choice in JAMB applications. Candidates willing to change to the institution as the first can still do so before the closing date. Selection of candidates will be based on the possession of requisite academic qualifications, good performance in both the written examination and oral interview. The written examination for ND applicants will be tested in: English Language, Mathematics and General paper. 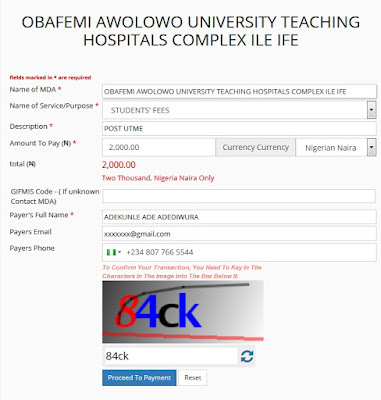 Interested ND applicants are to pay a non refundable fee of two thousand naira (#2,000) while HND applicants are to pay six thousand naira (#6,000) respectively through REMITTA payable to OAUTHC, Ile-Ife account. Ready to apply? Visit SHIM page or Pay on Remita follow the guide below. After payment print you paymnet reciept or get it inside your email. Present this to collect your form. Completed application forms must be returned to the Ag. Head of School not later than 22th August, 2018, while screening exercise comes up on Wednesday 28th August, 2018 by 9am and Interview on Thursday 29th August, 2018.